Growing up in horse country, many of Alex’s fondest memories are of visiting Keeneland with her family – making it an easy choice to bring their dreams to life. I knew that with Evan’s family being from all over the US, I wanted to find a place that represented my upbringing and what Kentucky is all about. Keeneland is all of that and more. Alex and Evan wanted their guests to experience the variety of cuisine that Kentucky has to offer. The couple worked closely alongside Keeneland’s culinary team to develop a menu that showcases classic southern comfort foods that pairs well with the elegant buffet. During cocktail hour in the Keene Barn, hors d’oeuvres included pretzel spoons with short rib BBQ, Kentucky hot browns, and corn cake & pimento cheese sliders. The buffet consisted of both fish and chicken options, as well as a caprese salad. Sitting on a rustic wooden box that accentuated their southern theme, the wedding cake of their dreams finished off the night. "Evan talked me into flying home for a weekend with my nephew and family. That was pretty easy to do, since I was often homesick. Once I arrived in Lexington, I got ready for a lunch with Evan and my best girlfriend. From there he told me we had to watch my nephew for a few hours, and then go to dinner with friends. Once we got to my nephew’s, Evan mentioned that my Dad wanted us to come see his new horse. The problem was, I didn’t want to go. It was pouring down rain. You definitely know Evan is in sales, because he pitched the idea pretty hard, and got me in the car and headed to the farm. When we arrived, we pulled up and nobody was there. He pulled straight up to the barn, and I knew we had to go around to the side to actually get in. Yet he suggested we get out at the front, and walk around. I was not pleased, but got out my golf-size umbrella, and prepared for the short and muddy trek. When we turned the corner to the barn’s entrance, there was a chalkboard with Evan’s sweet handwriting saying, “Will you marry me?" I was shocked. We walked into the barn, where a photographer was waiting, capturing all of the moments I can’t remember. Regardless, I said YES and we then headed out to another big surprise. He started driving towards Versailles, where we would eventually meet our families and closest friends for a celebration. It was perfect, sweet, southern, and totally us!" Were there any songs that were played that hold a special place in your heart? 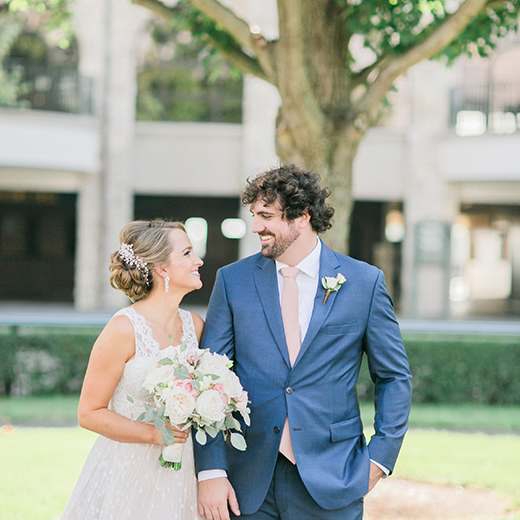 "I handpicked all of the ceremony songs and two of our best friends performed the vocals. That right there was special. Walking down the aisle to our best friends playing and singing songs that represent us, was pretty cool. I also loved our first dance song, by Charles Kelley. “The Only One Who Gets Me” was written for me and Ev, if you ask me." Were there any traditions that you tied into your wedding day? "There were several special moments that weekend, first being at the rehearsal. We got to rehearse in the paddock of Keeneland, where I pretty much grew up. I also got to redesign my Mom’s wedding gown from over 30 years ago and wear it to my rehearsal dinner. That was one of the neatest things I have ever done. I also wanted my grandparents to be a part of my day. I used one of my grandmother’s broaches on my bouquet, and up until the moment I walked down the aisle, my Grandad held my hand. He’s no longer with us, he passed shortly after the wedding, but he always held my hand when I was nervous." Did you decide to do a first look or wait to see each other down the aisle? "We did decide to do a first look, although I was hesitant in doing so. I wanted that first moment to be down the aisle because it’s so special. However, logistically, it was so much easier doing a first look. It allowed for us to take pictures early on and get things out of the way so that we could really enjoy all of the moments. Our photographers and videographers made our first look very, very memorable and special. I can’t thank them enough for that."